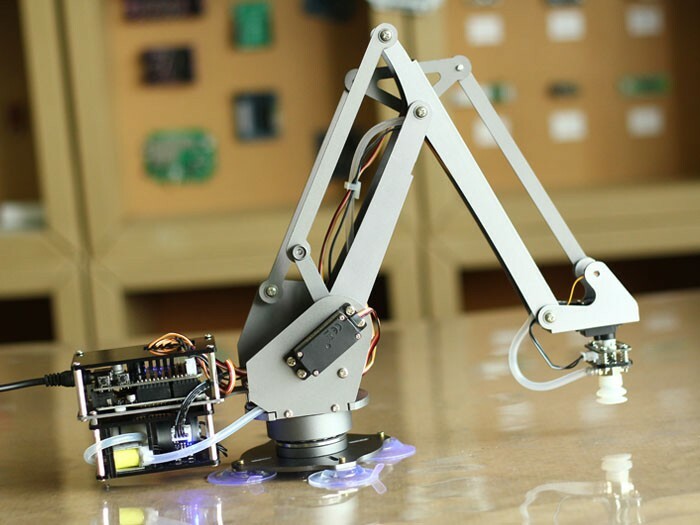 Introduction: uArm is an Arduino-powered desktop 4-axis parallel-mechanism robot arm, modeled after the ABB industrial PalletPack robot. The new uArm is made of metal, powered by smaller-sized but more powerful servos, and controlled by an Arduino-compatible board. 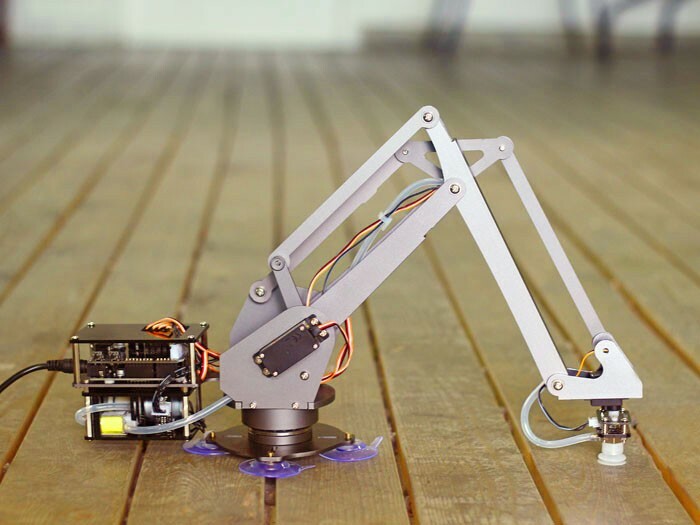 In parallel-mechanism robot arm, most of the masses concentrate on the base, making the robot much more stable and allows the upper Arm to react really fast. What can you do with uArm? Well, in two words: COOL Things!!! 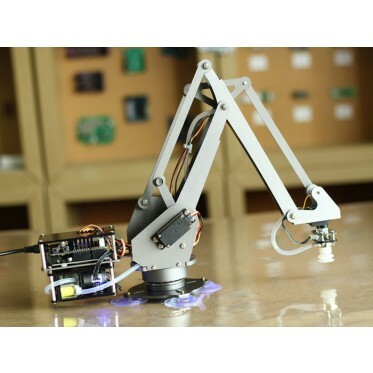 Once you got your uArm, you can immediately customize it with your own components. For example: You can add a LED to make a computer-controlled desk lamp! Or play chess with you! Or pick up an apple for you! How do I use it? Right now we have already developed a Windows application that allows the uArm to be controlled with keyboard or mouse. We have just sketched out a new function for the uArm which allows you to simply dragging it around as the uArm records the critical coordinates for later playback! With this function, you can now TEACH the uArm to accomplish simple tasks without writing a single line of code, or even connecting to your computer? Features: Made of metal parts Smaller-sized but more powerful servos Based on Arduino Complete assembled kit. No need to assemble by yourself. Supper easy to use. 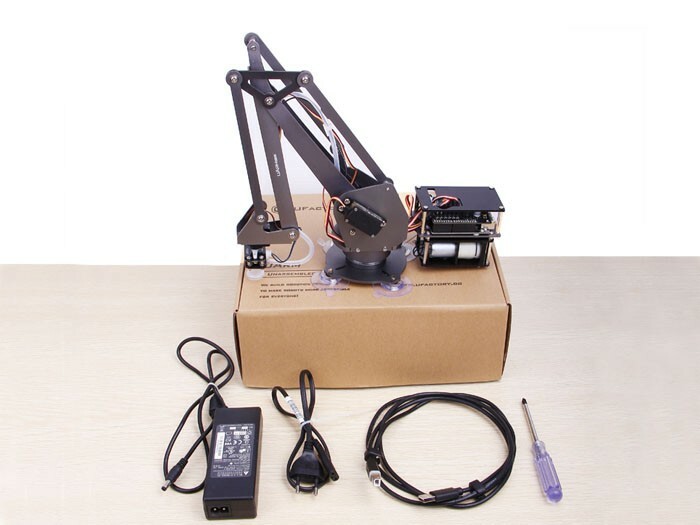 The torque of servo is 9kg/cm Specification: The Metallic uArm comes with complete mechanical parts in metal, 3 metal servos, 1 micro servo, 1 Arduino compatible board, 1 uArm shield, 1 USB cable and 1 Wall Adapter Power Supply. If you have any questions, feel free to send us an email to [email protected].